The Antica Cascina was once part of the feudal estate belonging to the noble Roero family, present in the region between 14th & 18th centuries. More recently it was the property of the famous coffee merchant, Deorsola of Torino, before being bought by current owner Daniela Olivero’s family in 1957. From being a traditional ‘fattoria’ (farm), growing a variety of crops & raising cattle, in 1975 the Antica Cascina dei Conti di Roero took the decision to focus 100% on the vine. 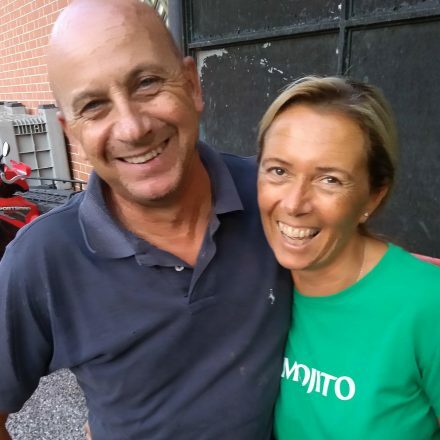 The 1980s saw the first commercial bottling of the wines, & in 1995 the then 8ha property passed to Daniela Olivero & her husband Luigi Roagna. The estate now measures 13ha, of which 70% lies in the comune of Vezza d’Alba, 20% in Canale, & 10% in Monteu Roero. Key menzione geografiche aggiuntive (MGA) are Sant’Anna, where the cantina is located, & Sru, a cru that’s closer to Canale. Marine sand over marne dominates the Vezza d’Alba & Monteu Roero geology, while Canale (Sru) is more clay rich. The average age of the Nebbiolo vines is 30yo (for Nebbiolo d’Alba), while the Roero DOCG Vigna Sant’Anna comes mainly from a 1ha plot planted in 1954. They focus on producing Roero Arneis ( from Vezza d’Alba & Canale), Langhe Favorita (Vezza d’Alba & Canale), Nebbiolo d’Alba (Vezza d’Alba), Roero DOCG (Monteu Roero & Vezza d’Alba). In vintage 2018 they will be producing a single vineyard Roero Arneis from the Sru vineyard close to Canale. 2018 Langhe Favorita, Vezza & Canale – tasted Nov’18 from tank, harvested 10 Sept; puro pompelmo/yellow grapefruit spremuta! Fine. 2018 Roero Arneis, Vezza – tasted Nov’18 from tank, from sabbia marina, light white marine sand over marne, pure South facing, subtle, pretty, detailed & delightful! 2018 Roero Arneis Vigna Sru, Canale – (from vintage 2017, Roero producers are able to use the MGA vineyard name) tasted Nov’18 from tank, harvested 10 Sept, from the Canale clay rich vineyard of Sru that lies on an East facing shoulder, slightly lower down, & close to the town. More intense in colour than the Vezza d’Alba fruit, more structured too, with almost ananas/pineapple richness/presence, salivatingly sapid, more masculine vs the feminity of Vezza! Un vin de garde? 2017 Roero Arneis, Vezza & Canale – tasted Nov’18, bottled June’18 after 12mths on fine lees, DIAM5, 13.3%, from 250m asl high amphiteatro vineyard that surrounds the cantina, fine, fresh, yellow/mandarin fruit, elegant, juicy, piu grasso/broader than the Favorita, hints of quince & sea salt. Lemon pulp. 2016 Nebbiolo d’Alba, Vezza – tasted Nov’18, bottled in Nov’17, from 30yo Vezza vines that look down on the cantina below, aged for 8 mths in botti & barriques. Fine, violacce/violet scented, raspberry coulis, pretty blueberry fruit expression (of the vintage), creamy to taste, but noticeably barricato, ahime. 2015 Roero DOCG Vigna Sant’Anna, Monteu Roero – tasted Nov’18, bottled Dec’17, DIAM10, macerated 25 days on the skins, from 1ha of 1954 planted Nebbiolo vines that form the apex/Bricco above the Cascina, high up at 320m asl, on fossil-strewn white talc soils that actually lie in the comune of Monteu Roero, as they’re on the border. Vinified in stainless steel & then aged in 42HL botti fro 24 mths. Rich red, crushed raspberry, cleansing, intense, pulp & rosehip, cleansing, still young & tense.